Luis Aldamiz (aka Maju) is an independent Basque researcher who has concluded that the Atlantean Empire was at the centre of the VNSP (Vila Nova de São Pedro) culture in ancient Portugal(a)(b). Its capital Zambujal was situated near the modern city of Torres Vedras, just north of Lisbon. He bases his idea on a number of topographical and historical parallels between the VNSP region and Plato’s description of Atlantis(c). In order to have Plato’s account of the Atlantean War conform to his location theory, he suggests that the Mycenaean Greeks fought alongside the El Argar people in southeast Spain against VNSP Atlanteans! The evidence for such a military alliance is at best tenuous or more likely, purely speculative. However, the idea is not as farfetched as it might seem when combined with the views of W.Sheppard Baird who claims that Minoans had been the colonisers of Los Millares in Andalusia as early as 4000 BC. In due course, the culture of Los Millares was superseded by that of El Argar. 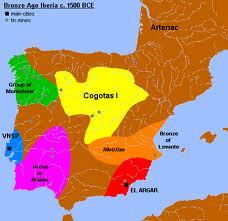 This begs the question as whether the Mycenaeans who had succeeded the Minoans on Crete also replaced them in their Andalusian colonies! Nevertheless, no matter how interesting the theories of Aldamiz and Baird may be, they have still to explain Plato’s claim that the Atlanteans ‘controlled’ Europe as far as Tyrhennia, along with part of North Africa, before their eastward invasion! Furthermore, the part that Egypt played in their alliance with Athens in the war with Atlantis is totally ignored by them.